IDF soldiers entered the Gaza Strip on Saturday morning and began operating near the northern Strip town of Sajaiya. According to reports, 70 Palestinians were killed in heavy exchanges of fire which erupted in the area – the largest number of fatalities in a single IDF operation in the area since the Gaza pullout. The Palestinians further reported that 12 of the casualties were civilians, including eight children, three women and two unarmed men. More than 60 Palestinians were injured. Most of the gunmen killed were Hamas members. Several others were Islamic Jihad operatives and one was a member of the Popular Resistance Committees. Five IDF soldiers were lightly to moderately injured in the clashes, two sustaining light to moderate wounds, and the other three lightly injured. The troops were evacuated via helicopter to the Soroka Medical Center in Beersheba. Givati and armor forces were deployed near Sajaiya on Friday night, not far from the populated area, in a routine operation aimed at uncovering terror infrastructures in a bid to thwart terror attacks planned in the border fence area. Although there is no direct connection between the recent escalation in the south and Friday night's activity, IDF officials estimated that terror organizations would attempt to target the soldiers, and that the resistance level to the operation would be high. "The activity is taking place in areas which the terror organizations want to guard, including launching pads," a military source explained. "We are fighting against a large scope of armed gunmen. The soldiers have encountered various countermeasures, such as explosive devises, anti-tank missiles and sniper fire. "There have been several attempts (by gunmen) to try and harm the troops in order to accomplish a show of force, but the soldiers are ready for it," added the source. "The IAF is assisting us and the cooperation between the ground forces and the aerial ones is satisfactory." Earlier Friday night, the Palestinians reported of four people killed in IDF strikes in the Strip, including a one-year-old baby. However, there were conflicting versions over the circumstances of the child's death. At first, the Palestinians accused the IDF of attacking the baby's house, but later reported that the house was hit by a stray rocket fired by the Palestinians from within Gaza. On Friday evening, the IDF reported that it had struck a weapon manufacturing site in the central Strip, as well as a rocket launching pad in the northern Strip. At around midnight, sources in Hamas reported that Eyad al-Ashram, an arms expert, died when a missile fired by the IDF struck open ground after dark in the north of Gaza. The rocket attacks on Ashkelon and the western Negev continued Saturday morning, as Palestinians fired three Grad missiles at Ashkelon, one of them directly hitting an apartment building. Three residents, two of them children, were evacuated in light condition to the Barzilai Medical Center in the city. Several people were treated for shock. More than 30 rockets were fired from Gaza since Friday night. 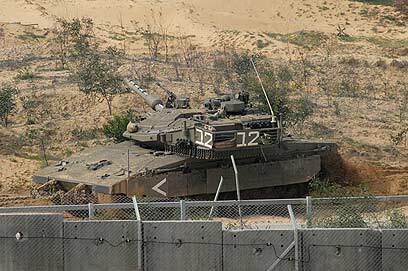 Meanwhile, Palestinian sources in Gaza reported that the IDF has struck two militant cells in northern Gaza. Earlier, IDF forces targeted a vehicle in the Strip's north. The sources reported that two gunmen were killed in the strike, one in a targeted strike and the other by sniper fire. Saturday night saw two more Hamas operatives killed in an IAF raid on a Hamas police station in southern Gaza Strip town of Khan Younis. Palestinian sources later reported that the bodyguard of Hamas leader Hamas leader Mahmoud al-Zahar was killed by IDF fire in the northern Gaza Strip. IDF forces continued to hammer targets in Gaza all through Saturday, as Palestinian sources reported five people were killed in two separate IAF strikes in Rafah. According to reports, the strikes targeted both a Hamas police station and a local mosque. The IDF confirmed its forces struck a Rafah building housing several Hamas operatives, Saturday night; confirming a hit. Palestinian sources later reported that two more Hamas operatives were killed in Gaza Saturday. One of the men was Haled Attallah, a senior operative of Hamas' Izz ad-Din al-Qassam Brigades, whose home was raided by IDF troops earlier Saturday. The other was reportedly killed IDF fire in northern Gaza. Attallah died of his wounds at a Gaza City hospital. His wife and three of his children were also killed in the IDF raid. Faced with the weekend's death toll, the Hamas government in Gaza declared a full school strike and three days of mourning. The decision is not expected to be implemented in the West Bank. See all talkbacks "70 Palestinians killed in IDF operation in Gaza"